Sparks fly when Wade Walker (Craig Robinson) crashes the preppy Peeples annual reunion in the Hamptons to ask for their precious daughter Grace's (Kerry Washington) hand in marriage. Wade might be a fish-out-of-water among this seemingly perfect East Coast clan, but he’s not about to let himself flounder. Instead, in a wild weekend of fun, dysfunction and hilarious surprises, Wade is about to discover there’s room for all kinds of Peeples in this family, no matter their differences. Writer and first-time director Tina Gordon Chism (writer of DRUMLINE) joins forces with Tyler Perry to present a laugh-out-loud look at the family ties that freak us out . . . but bind us together with love. 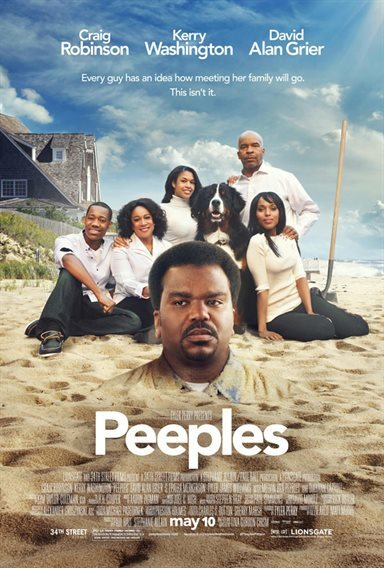 Download Peeples in Digital HD from the iTunes store. Peeples images are © Lionsgate. All Rights Reserved.